We have some exciting news! We just learned that in honor of #GivingTuesday, Facebook and the Bill & Melinda Gates Foundation will contribute up to $1 million to Facebook fundraisers. The Bill & Melinda Gates Foundation will provide $1,000,000 in matching funds, up to $1,000 per Facebook fundraiser, and Facebook will waive up to $500,000 of fees on all donations. 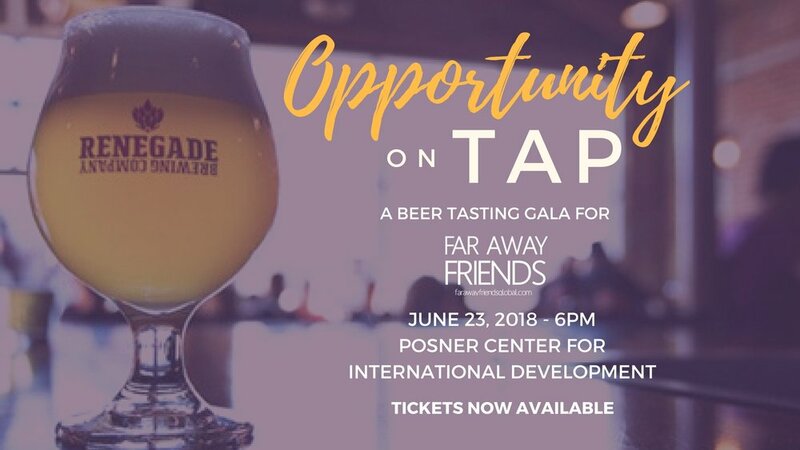 As a supporter of Far Away Friends, we’d be honored if you would take this opportunity to reflect upon your commitment to our work by creating a Facebook fundraiser. Your fundraiser could help fund up to $1,000 toward building a dorm for our students in rural Uganda! Creating a fundraiser is easy. • From there you can invite friends, share on your News Feed or send a message! Here’s a little more on what we’re doing this #GivingTuesday and how you can help in other ways. MAKE A DONATION ON OUR WEBSITE! LIVE IN FORT COLLINS? Attend our #GivingTuesday Launch Party at Beau Jo's Pizza! Have dinner at BeauJo's Pizza in Fort Collins and 20% of every sale will be donated to Far Away Friends in honor of the #WhereWeLive Campaign! Our Development Director (Kaitlyn) and Regional Manager (Siena) will be live streaming on Facebook from the event! As always, Thank you for your support of Far Away Friends . We are really excited about #GivingTuesday, and hope you will participate in all our year-end activities! Close your eyes for a moment and imagine: you’re in your childhood home and you wake up on a Monday morning. Maybe your mom or dad is calling for you, or you’re walking down the hall, quickly pulling on clothes and rubbing the sleep out of your eyes. Instead of stopping at the bathroom to grab a drink or brush your teeth, however, you put on your shoes and begin a nearly two mile journey for water, where you will wait hours in line and hand carry gallons of the stuff back to your home. This is an unimaginable reality for many of us, but one that students in Namasale, Uganda live everyday. Zoi Johns (left) presenting her final check to our Executive Director, Jayme Ward. Because of this, Far Away Friends has a personal and vested interest in water conservation efforts and clean water projects. That’s why this International Water Day, we’d like to focus our donor spotlight on Zoi Johns, who plays a huge role in our efforts to provide clean water to our students at Global Leaders. Zoi is a junior studying at Lakewood High School, president and founder of the LHS Rotary Club, and has been a Girl Scout for over eleven years. Through her partnership with the Evergreen Rotary Club, Zoi has raised $5000 for Far Away Friends, money that will provide three much needed water tanks at the school. For the students, this means no more leaving class early to walk miles for water. For the teachers, this means more time for instruction and less worrying about how students will eat and wash. For the community, it means safer and easier access to clean drinking water -- something students, parents, and teachers alike have expressed great need for. While our focus at Global Leaders is quality education, our goal at Far Away Friends is to partner with communities in sustainable development. These go hand in hand; students cannot learn until they have clean water, good food, and a safe place to sleep. So on International Water Day, we thank Zoi -- and donors like you -- for leading us one step closer to clean, accessible drinking water for our students in Namasale. One of the small water tanks we've installed at GLP. Zoi's three 10,000 gallon tanks will be installed on the other corners of the building and are much bigger! We're Partnering with Schools for Girls to Build Global Leaders HIGH SCHOOL! When we opened our first school, Global Leaders Primary School (GLP) in Namasale, Uganda just last March, we *thought* we'd accomplished our biggest, wildest dream. After a crazy-successful first year of operation teaching grades Pre-K through P.5 and adding two P.6 teachers next month (learn how you can be a part of supporting our P.6 class through OperationTEACH ) we were challenged to dream even BIGGER. To continue to think further about how we can impact our students and their families even after they graduate from GLP after they take their P.7 high-school entry exams. To expand our vision and imagine our students graduating from GLP and moving on to their next adventure--high school. It was around this time that we were approached by Jaclyn Collins of Schools for Girls. Aside from the fact that she shares the same name with our Uganda Country Director(Collins...Collines, weird right?! ), we immediately felt like our meeting was somehow divinely planned. Jaclyn had been referred to Far Away Friends by a mutual friend and emailed us asking if we could meet up and share ideas about supporting girls' education in Northern Uganda and possibly building a high school someday. Ironically enough, Collines happened to be IN DENVER at the time and had brought with her drafts and plans for building a Global Leaders Senior Secondary School. We had hoped to present the plans at our year-end board meeting so that in two years time, our first graduating P.7 class would have the opportunity to seamlessly move into a high school with the same emphasis on global citizenship, empathy and equality in learning. When we met Jaclyn for coffee and talked though each other's ideas were literally all speechless. What were the odds that our next big dream for Far Away Friends and our students at GLP would coincide with Schools For Girls' plans to launch a high school with emphasis on global citizenship, empathy and equality in learning in Northern Uganda. he Universe works in the most mysterious ways, people. After only a few meetings, we knew that a joint partnership between Far Away Friends and Schools for Girls would not only provide students in Namasale with an incredibly high quality high school education, but could help totally transform the standard of education in this community as a whole. In 2016 we opened our first primary school--and that was just the beginning. 2017 is going to be UNBELIEVABLE. We're ready. Join us. The opportunities for positive impact on some of the world's most remote communities are endless when we work together. Learn more ur partnership and about our impact by visiting the Schools for Girls website right here. The Denver Business Journal announced today that Far Away Friends Executive Director and Co-Founder Jayme Ward has been nominated for its 2017 “40 under 40” award. The 2017 program highlights the best in business that metro Denver has to offer, recognizing 40 outstanding local professionals under age 40 for their business success and community contributions. The winners will be announced in the Feb. 3 issue of the DBJ and online at DenverBusinessJournal.com, honored at an event on March 16, and profiled in a special report publishing March 17. Congratulations, Jayme! It's time to kick off your week, we've created a Mixtape of some of our favorite tracks we've been enjoying this month. It’s Wednesday morning. I wake up, make my coffee, and attend class. I listen to professors as they do their best to teach me to be the best teacher I can be. In the afternoon, I’ll make another cup of coffee and head to a local middle school, where I’ll tutor 6th grade students in English and Social Studies, guided by two incredible mentor teachers who are as invested in my teacher training as they are in their students’ learning. Every day, I learn and I teach. Every day I take for granted that myself and those who teach me are paid a fair wage to do so. As a pre-service educator, I spend all day almost every day with teachers. The teachers at Global Leaders Primary School are some of the kindest, hardest-working, and most compassionate I’ve ever met. They spend their entire day off at literacy trainings. They stay hours after school to play games with their students. They work with limited resources and materials and travel miles and work unbelievably hard because they believe, like we do, that the kids they teach are the future leaders of Uganda. This is why I do what I do. This is why I work three jobs and eighteen hour days and stay up nights and push myself harder and harder -- because the teachers at Global Leaders Primary School have as much a right to a fair wage as I do. I work this hard because I know that when I pack up for the night, go home and crawl into bed, Madame Eunice is ringing the morning bell. I work this hard because I know that halfway across the world, in a beautiful village that I have come to love, the teachers of Global Leaders Primary School are working even harder. And, sometimes, I am heartbroken because I know I can only work so hard. I can only give so much of myself to ensure that these teachers get what they have a right to -- a fair wage for hard work. At some point, I’ve got to ask for help. To promise a fair wage to the teachers of Global Leaders Primary School, I need 25 people to promise $20/month to Madame Eunice, and Madame Sarah, and Teacher Sebastian and Tom Richard -- and to me, and Jayme, and Chris, and Collines. All our sleepless nights, days in and days out and hours and hours of work can only do so much. It comes down to you, and your sixty cents a day. It comes down to me, making an honest cry for help. It comes down to us, combining sleepless nights and eighteen hour days with just $20/month to promise real teachers in real classrooms the fair wage that they have a right to. Join me in funding OperationTEACH, and ensure fair wages for teachers -- all teachers, everywhere. This past summer, our US Executive team had the privilege of taking three incredible volunteers from Lakewood High School on a 3-week Volunteer Immersion Trip to Uganda. Jessie Jennett, Siena Tornillo and Dakota Kisling joined us for their first trip to the African continent to work alongside us at our new primary school, Global Leaders. Over the 3-week trip, we traveled nearly the entire length of the country -- from Kampala to Namasale all the way to Murchison Falls, with the goal of immersing ourselves in Ugandan culture, to learn about impactful community-driven projects on the ground, understand the power of cross-cultural partnerships and think critically about best practices in serving our global community. We also *might* have spent a fair amount of time introducing Siena as an American pop-star and teaching everyone in the compound how to roast the perfect marshmallow for S'mores. This trip was not only special because it was the first time we've taken volunteers out with us, but it was also our Development Director for FAF, Kaitlyn's first time to Uganda after nearly eight years of studying African issues! You can read about her experience on our trip on CSU's blog right here. We upon returning home, we interviewed Dakota (17) Siena (18) and Jessie (18) about their experience on our first Volunteer Immersion Trip. What made you want to go Uganda? SIENA: I wanted to go to Uganda because I wanted to be part of something bigger than myself, and Far Away Friends provided me with that opportunity. I needed a new perspective on my life, and I got that in the most unique way possible. How do you feel Far Away Friends' Immersion Trip was different than other volunteer organizations you could have traveled with? JESSIE: Because I am so interested in traveling I have looked at many travel/volunteer organizations whether it was for a language immersion or a school trip, and in order to convince my parents I had to dive deep and know everything about the organization and the trip. Compared to the three groups I looked into previously, Far Away Friends had the best communication. Through the application process, the waiting period, and even with our parents through the trip, Jayme and Chris really made sure that everyone was on the same page and no question was left unanswered. Regarding the trip itself, I cant compare it to any other organization's trips, however I think because of the strong connections that Far Away Friends has within multiple communities in Uganda, that we received a more intimate and deeper experience than most people on trips like that do. How did traveling with Far Away Friends changed the way you look at the developing world? SIENA: Traveling to Uganda I had no idea what to expect, but when we got there my mind was blown. Generally Africa has a stereotype of being “unsafe” or “dirty,” but that couldn’t be further from the truth. The country of Uganda itself was beautiful the people were just beyond amazing. Although it’s developing, Ugandans are the most kind-hearted people I have ever met, and everyone welcomed us with open arms. Everyone that I met was so happy and so grateful for everything that they had. In what way do you feel that you had the biggest impact? JESSIE: I think that visiting Global leaders primary school, playing with the students, interacting with the teachers and staff, has definitely evolved my ability to spread the word at home. I felt that the more I learned about Far Away Friends, and the more I got to see first hand, the more I believed in what they stand for. I feel as if FAF is really one of a kind and that the work they do is genuine and across the board to benefit the world as a whole. They take the name Global Leaders seriously and I think they do a phenomenal job of working together with their staff and community towards a common goal of providing quality education and connections to those future global citizens. DAKOTA: I met so many people that changed my life, but two stand out to me the most. They are Mercy and Sam (two students at Global Leaders). From the moment I met Mercy I was in awe. She is so smart and loves school unconditionally. She made me realize how much school can mean to someone, and how much it should for everyone. We take it for granted here, but Mercy understands how important the value of schooling is for her future and for generations to come. Sam also touched my heart. Although he has Down Syndrome [in a community with little support for children with special needs], he has an unlimited capacity to love. He made me realize how much someone could mean to someone else. He made me realize how lacking our country is of true connection. I want to carry his love here [in Colorado] and show others 1/100th of what he showed me...THAT is how much he inspired me. JESSIE: I felt most connected when we all went to Mama Cissy's, where we met Aunt Stella and Atat (Grandma), along with all of the children under mama Cissy's care, most of whom attend Global Leaders. We learned that grandmothers are the same even on the other side of the world, by being welcomed with soda and cookies. The children were so fun and full of energy, we were taking pictures, laughing, and talking to each other. We started showing pictured of our pets, then our families, and as I swiped through pictures of my parents and sisters, I felt like I was a part of their family and that I couldn't wait to show my parents and sisters pictures of my family in Namasale. Our team visiting Mama Cissy's home and meeting with the Mayor of Namasale village. Who did you meet on your trip that had an impact on you and why? SIENA: Everyone that I met on my trip was amazing. There was one little girl named Fiona (also known as Baby Fiona) who touched my heart in such a special way. She came to the school a few days after we arrived and although she is only three years old I saw the kindness in her heart. Another person who had an impact on me was one of Global Leaders’ older girls name Cece. As we were walking home from her mom’s house one night she was holding my hand and we were talking. I was telling her about how Uganda and America are very different; she was amazed at the fact that we think dogs say “woof.” She explained to me why she thinks being educated is so important and why she wants to continue going to school. This moment was so special because even though she is only in P5 (fifth grade) she knows how important education is and she inspired me to push myself harder in my educational goals. What was one of your biggest challenges in Uganda and how were you able to overcome that? DAKOTA: One of my biggest challenges was not the bugs, the squatty potties, the bucket showers, or the hotness. It was seeing how much people who did not have much give you everything they had, whether it be food or something else. It was hard for me because it made me realize how backward our own country is. We only care about ourselves and the very few people who surround us. Every person we met in Uganda embraced us as if we were their own child. We literally came from around the world and they loved us like they had known us forever. I know that does not seem like a challenge, but it really opened my eyes to something that I had never seen before, and I did not like that reality. JESSIE: If not for this trip and experience with Far Away Friends, I don't know if I would have truly found my passion. The constant feeling I had being there with the FAF team, the friends and family made there, and witnessing the impact of an education. I also feel like I have learned a lot about traveling and looking beyond what I hear in the media and stereotypes. What would you say to someone who is considering volunteering with Far Away Friends? JESSIE: I would highly recommend volunteering with Far Away Friends, I think that everyone should receive the opportunity to meet the wonderful people of Namasale town and the students at Global leaders. Its an experiene of a life time and I genuinely thing that Far Away Friends provides a unique and unforgettable experience that not many people will ever go through. SIENA: To anyone who is considering volunteering with Far Away Friends do it. It will be the BEST experience of your life. Before we left Jayme told me that during this experience you will be: the saddest, most afraid, most uncomfortable, yet the most insanely happy you have ever been in your entire life. This was 100 percent true. There were challenging moments were I thought I was going to scream or cry, but at the same time I was so happy. Jayme, Chris, and Collines were the most amazing team leaders. I felt so prepared and safe everyday I was there. Far Away Friends will give you the most unique experience of Uganda. I wouldn’t trade my experience for anything in the world, and now that I have met the students and teachers of Global Leaders I know how important my voice is so that this amazing place that I call home can and will succeed. DAKOTA: I would say DO IT!!!!! It was by far the best experience of my life and even though it is hard to see some of the things we saw in Uganda, it is worth it. You will come back a changed person and have an amazing perspective of the world because of that. DO IT!!!!!!!!!!! When I was a kid, my favorite book was Rainbow Fish. Either that, or anything on the subject of Witches. I got lucky having such amazing teachers and supportive parents throughout my childhood who helped me develop a love for reading. I never struggled at sounding out words or stringing together sentences which made trips to the library with my friend and her mom an exciting experience. We'd sit on the floor at the base of a huge bookshelf in the SciFi/Fantasy section and spend hours choosing an adventure we wanted to become immersed in. For many of my friends who grew up in rural Northern Uganda, their experience with reading is probably much different. With little access to quality literacy programs at school or teachers trained in guiding students with reading difficulty, so many children in areas like Amolatar District, Uganda, may never develop a love for reading, let alone learn to read at all. According to Jeffery A. Smith of the Institute for Social Research, "only 44.5% of children pass basic literacy tests," in Uganda. The number in Northern Uganda is likely even lower. Literacy rates are a paramount factor in the socio-economic development for places like Namasale Sub-County. An illiterate farmer may never be able to access resources that could help him develop a business plan and support his family more sustainably. He will never be able to help his children with their homework, or read them a bedtime story. He won't be able to read directions for administering medication to his wife if she falls ill.
At Far Away Friends, we believe so strongly in the power of literacy to transform lives. Once our school begins in Namasale, we hope to provide evening and weekend adult literacy classes for the parents of our students so that they may be able to support the learning needs of their children, and support themselves, to a higher degree. Join us today, on International Literacy Day, in joining together to make a promise to the community of Namasale, Northern Uganda, that we support their desire to improve the quality of education for the next generation of leaders. Join us in finishing our school. Far Away Friends is Taking Over CSU! Hello, FAF supporters, Kaitlyn here! Just a short update from up here in Fort Collins: These past few weeks, I’ve been working to implement Far Away Friends’ first university club at Colorado State University, and while I wait for all the paperwork to be finalized and first official meetings to be planned, I thought I would introduce you guys to the officer team we’ve established so far! First we have Hannah Drennen, who will serve as our Vice President, and whose responsibilities mainly include getting our social media started, and giving the FAF club more of a presence on campus. Next is Colton Myhre, our Fundraising Officer and Secretary; he’ll be recording meetings and documenting minutes as well as finding the best way to implement all our fundraising ideas/ helping to come up with new and innovative ways to fundraise for Far Away Friends in Fort Collins. This small team has a lot of big ideas, and we can’t wait to implement them and keep you all updated on the progress. As CSU’s Far Away Friends club expands, I’ll be posting updates here every so often to let you know what were doing, how it’s going, and how this club will continue to do its best to promote the Far Away Friends mission. Hope to have an update for you all soon! It’s a question many of us hear between the ages of 5 and 25, and the answer to it -- for me, at least -- seems to change as often as it’s asked. When I was five it was a princess, then at six it was one of the PowderPuff girls, and until I was ten I swore up and down I was going to be a PowerRanger. Though I never got to be a PowerRanger or a princess, I did have many amazing opportunities to learn and explore and discover, and by my freshmen year of high school I found an organization called Invisible Children, a nonprofit that works to end the use of child soldiers in central Africa; this is where I found compassion and kindness and purpose, and this is where I met Collines. I met Collines the way many people met Collines between the year of 2007 and 2013: after the screening of an Invisible Children film, after hearing her story and her mission, and (of course) with tears in my eyes. She, along with many of the people I’ve met in the Invisible Children community, inspired me to find what I thought was wrong with the world and do my best to work towards a solution. I met Jayme in much the same way, at a conference held by IC in 2013 that we both attended. We were both passionate about education and our hearts went out to the plight of those in Uganda, an area we worked closely with through IC, and a place that many of our now close friends call home. I remember her talking about Far Away Friends then, just a dream built and believed in by two best friends on different sides of the world who believed that where you live should not determine whether you live, and that every child has the right to an education. Fast forward to 2015 and it is amazing to see what these two have accomplished. In the summer of this year, I applied to be Far Away Friends’ Development Intern for two reasons: 1) because I saw (and see) so much potential in this organization to do so much good, and was willing to take any and every opportunity to be a part of creating that, and 2) since discovering IC, working at a nonprofit like FAF had become my answer to the “dream job” question. I was ecstatic when Jayme, Collines, and Chris agreed to take me on as an intern, and absolutely over-the-moon when they asked me to join the team permanently as the Development Officer this fall. As the Development Officer for Far Away Friends, I work to inform more people about what we do as well as encourage them to get involved in sustainable ways. As an undergrad studying English Education at Colorado State University, I’m currently working to implement the first Far Away Friends club on campus, including holding weekly meetings, planning fundraising campaigns, and organizing events to raise awareness. In my spare time I read and write a lot: something that’s kind of unavoidable as an English major. Some of my favorite authors are the ones who instilled in me a desire to help people, and a desire to teach: Toni Morrison, Chimamanda Adichie, and Junot Diaz. I’m a lover of coffee and green tea, spoken word poetry, and road trips. I have a twin brother who attends my rival university, my favorite novel is A Farewell to Arms by Ernest Hemingway, and I currently pay the bills by assistant teaching in a preschool classroom and working nights as a barista (hence the aforementioned coffee addiction). Most importantly, I am thankful to be working for such an incredible organization and with such an amazing team. Not many people ever get to work their dream jobs, and I feel so fortunate to have found such great passion and purpose here at Far Away Friends. I’ve been in love with this photo from the moment I took it last July in Northern Uganda. There was something about the girl in the blue dress that I couldn’t turn away from. This was a girl, probably no older than thirteen, who lifted a 40-pound jerry can of water onto her head with such ease and grace that would shock many adults here in the US. As she balanced the jerry can and began to make her way back home, I caught her slowing her pace and letting her eyes wander to the field of elephant grass that broke down the middle, carrying a footpath that would bring her back to her evening chores undoubtedly awaiting her back at her family’s compound. When I took this shot, I wondered whether this girl who carried so much weight on her shoulders (literally and figuratively) had ever been lucky enough to attend school. Had her family been able to provide her with the opportunity to have her mind opened to all the wonders of the world, which she’d definitely heard other uniform-clad students from her village discuss? 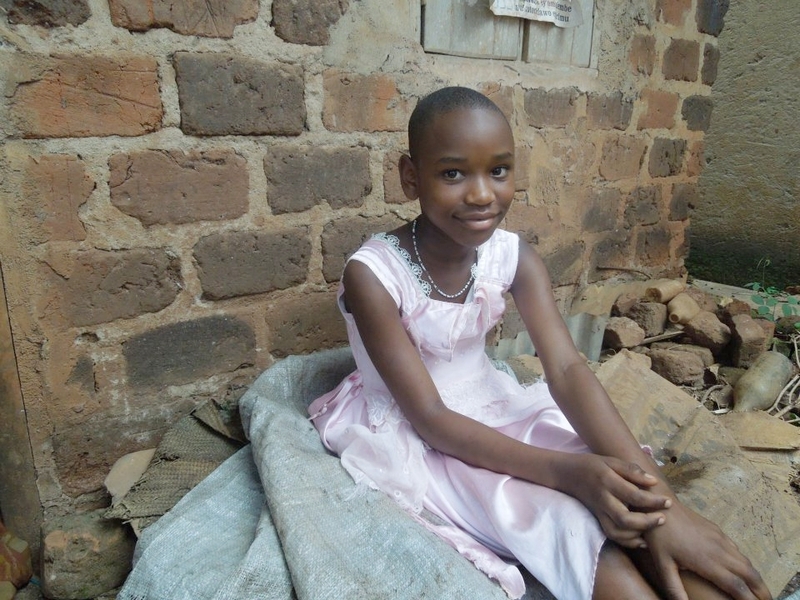 Had she been told that someone believed she could become a doctor or a lawyer or an artist? Did anyone ever encourage her to dream about the impossible? Did she realize her power to change the world? I thought back to our school in Namasale. The same wonder and consideration that was present in the eyes of the girl in the blue dress was also present in so many of the children we’d met in Namasale. I tried to imagine these same children sitting at a desk, feeling proud of their new uniforms and knowing that they’d been given a chance at creating a future that was entirely free of boundaries. It gives me chills to think about what these kids will become twenty years from now. 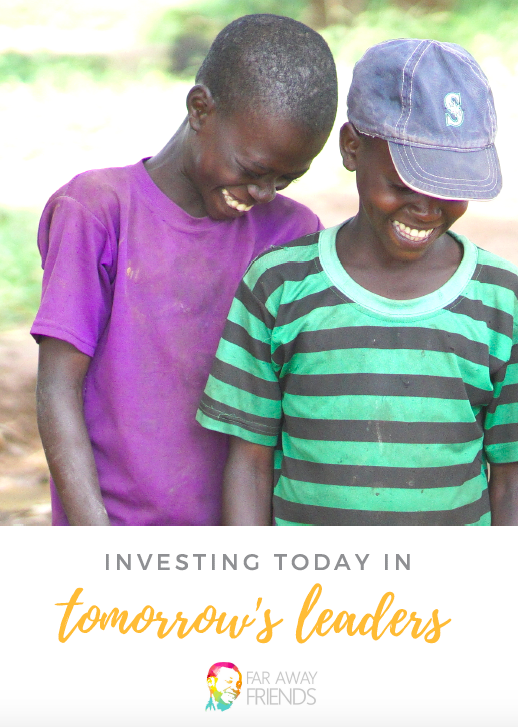 The students at our Leadership Academy may become the next President of Uganda or a biochemical engineer who creates a pill to cure HIV or maybe even the next Chinua Achebe or a war-stopping activist like Leymah Gbowee. Their potential is infinite—if only they are given the tools to unlock it. I look at this girl’s photo all the time. Her photo has inspired so many considerations in my mind and filled my own eyes with wonder just as hers were. I hope with so much of my heart the Universe allows for me to cross paths with the girl in the blue dress again someday. I hope that I’ll be able to speak with her and learn her name and tell her how much she’s inspired me. But more than anything, I hope that instead of carrying a heavy jerry can, she’s carrying school books, pencils and lightness in her step, proud of the bright future that awaits her at the end of path through the elephant grass all the way to school. Today, after months of thinking, brainstorming, designing, scrapping ideas and re-designing, we’re so excited to finally release our new logo. For the past six months since we decided we wanted to design a logo that better reflected our mission and our brand, we’ve consulted with professionals and friends to try to imagine what this new icon would look like. As more time passed, our ideas became increasingly more complicated and abstract until we were looking at a logo that we couldn’t connect with at all. During this process, we kept thinking back to a tee-shirt design that we’d created while we were still in Africa. The design was simple, created using one of our favorite photos from our trip of a boy that intrigued us named Emmanuel. After so many months of redesigning and brainstorming, we revisited this tee-shirt design and realized that the image we were searching for had been right in front of us all along. Our new logo is simple, but iconic, just like our vision. Education is timeless, but always a vital part of revolutionary change. Emmanuel’s smile struck us from the moment we met him. Here is a kid who is so young but whose life experiences and responsibilities have made him wise beyond his years. This is a child whose great potential, so evident in his smile, could be limitless with access to quality education. Like so many other children we met in Namasale, if only equipped with the right tools, their impact on the world would be extraordinary. Our new logo is more than a photo of a child, it represents the future of a community. The joy that results from the transformative power of education. A bright light sparked in a dim room. Our mission to educated leaders, to empower communities, and most importantly, to build dreams. social media platforms, literature, and website in the coming days! I met Katie Hutt in 2011 as I was on my way to Invisible Children’s first Fourth Estate Leadership Summit. It was my first time traveling by myself and I was totally terrified. Even though I was only flying to San Diego, being alone at the airport without the slightest idea of what to expect or who I’d meet when I got to the other side rattled by brain a bit. When I arrived at my gate, I noticed a girl who was also by herself, wearing and Invisible Children tee shirt. I breathed a sigh of relief and approached my newfound friend for the journey. What I didn’t anticipate was making a friend with the kindest smile and a larger-than-life personality who would become one of our first monthly donors and a constant Far Away Friends supporter since the beginning. I recently got the opportunity to interview Katie about her experience as one of our monthly donors. Katie, what do you do for a living? I’m a production artist for a small newspaper in Denver and an artist. I love anything creative including art, sewing, fashion, blogging and design. I also have huge passion for women and development. What makes you passionate about our mission to encourage global citizenship? After working with Invisible Children and then living in Uganda I learned a lot about Global Citizenship. I’ve come to see community as not limited by borders but by limited to our own understandings. I have made some amazing friends all over the world and they have introduced me to knew view points and ways of thinking that have forever changed the way I view the world. Being a global citizen empowers democracy by opening you up to ideas you would have never thought of. It doesn’t mean you have to always agree with them, but it means that you still love the person who has those ideas. What motivated you to become a monthly donor? Through my studies of development I’ve learned that there is a correct way to do charity. Researching the organization that you are giving to and making sure that they have locals on the ground running the programs is essential. Another important thing is that the community you are helping is invested in the programs as well, making sure that they hold a stake in what is being developed. These are few of the things I consider before donating. The most important part is that non-profits can’t make financial plans for the year unless they know where their money is coming from. One time donations don’t allow for organizations to pre-plan their programs which is why it is always better to choose an organization you believe in and researched and then continually donate to that organization. What advice would you give to our supporters considering becoming a monthly donor? If Far Away Friends is an organization that you fully support and believe in, then for them to truly strive they need more monthly donors in order to be able to plan and develop programs in Uganda and anywhere else they hope to build schools. Become a monthly donor like Katie by signing up here! Four years ago, two friends dreamed together about a day when we would build a school together. Collines and I talked on the phone for countless hours (racking up an impressive long-distance phone bill) about the passion we both had for educating and empowering the next generation of global citizens. At the time, the dream felt so big–almost impossible and certainly very, very far away in the distant future. What we couldn’t have imagined then was how fast it would all be realized. 2014 has brought with it so many incredible moments as our first year as an official organization. From the moment we decided to take the leap to become “Far Away Friends” over a year ago to now, ending 2014 with our first school built in Northern Uganda, our journey so far has been crazy, scary, exhilarating and absolutely unforgettable. As 2014 comes to a close, we wanted to share with you some of our favorite memories and milestones of the past 12 months. APRIL/MAY: We partnered with Little Man Ice Cream’s incredible Scoop for Scoop Program which allowed us to feed students at our partner school, Faith Children’s Foundation, for three months, light their dormitories and fix a leaking classroom roof! JUNE/JULY: We spent six weeks on the ground in Uganda, traveling between Bulenga in Wakiso District, where our pen-pal program is located, and Namasale in Amolatar District, where we are building our first school, the Leadership Academy of Namasale. This trip allowed us to further develop our programs on the ground in Uganda and understand in what ways we can improve and grow with our partners in development in the field. Some of our favorite memories from our trip include spending time at the building site of our school, hanging out with students at Faith Children’s Foundation and having crazy encounters with some African elephants on the Arua highway near Murchison Falls! AUGUST: We created the Roof Our School Campaign and held our second fundraising event in Denver at Epernay Lounge. NOVEMBER: We received our 501 (c) 3 Nonprofit Status (WOO!) AND launched our first online Built by Beads shop via Etsy just in time for the holidays! DECEMBER: We received photos from our team in Uganda of the Leadership Academy of Namasale with our new roof, almost ready for students! This has been such a crazy and incredible year for us, but we couldn’t have done it without YOU. All of our progress is a direct result of the generosity we’ve received from all of our supporters. Four years ago, Collines and I could have never imagined that we would be where we are today–ready to begin educating and empowering the next generation of global citizens. Together, we are building bigger dreams than ever before. Thank you for believing in us and with us. We love you.